Several months ago, Anna decided she was ready to start training for her first half marathon. 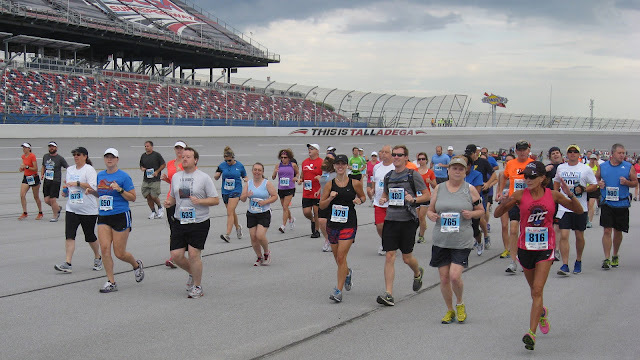 So we looked around and settled on a race that we were both interested in, the Talladega 21000 Half Marathon. This would be my third Half, and the legendary Talladega Super Speedway would provide quite a different backdrop from the races I had previously run in Birmingham and Huntsville. As training progressed over the course of a couple months, the miles added up as did the blisters, excitement and anxiety set in, and we avoided any injuries. On the morning of the race, Sunday, September 16, 2012, we set out early from Fultondale, headed for Talladega, with Anna's parents along for moral support, seeing many others who were similarly eastward bound. On this morning, the weather could not have been better, with overcast skies and rains to the east, making for some nice vistas as we ran. The event, in its fourth annual running, was well organized, with music and an energetic emcee to be heard throughout the course. And best of all, we finished at our goal time and saw a couple of other folks we knew who ran as well. If you're a half marathoner, this Talladega 21000 should be on your radar. Commentary, photos, and video from other races I have run in 2012 are also available: Russell Forest Run 10K in Alexander City, Statue to Statute 15K in Birmingham, and Run for Their Lives 5K in Fultondale.